Home/Life Health /Quit your complaining damn it! Complaint department is located down the hall, then a left, right, left, left, right, then out the exit, get into your car and take a long drive off a short pier. I had to get an epidural last week. Feel free to insert a pregnancy joke here: “How many pounds was your baby?” or “Have any problem pushing the little sucker out?” Ha Ha, you’re all real hilarious. Ouch. One thing I asked him, before he started poking me with long needles, was if I could look at my MRI and get an understanding of the problem. I use the term understanding loosely for my goal wasn’t to be able to rattle off T #’s or fancy doctoral jargon but to understand what was causing my complaining. After the procedure was over, he showed me the trouble spots and lectured me on what I had to do to cope with this for the rest of my life. 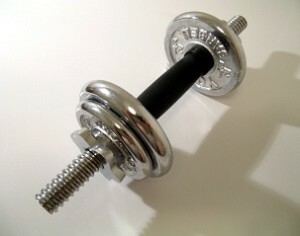 Part of my back problems are from lifting weights. There...I've admitted it. Part of my back issues are from weight lifting; I can’t deny that. Some of them are from age. It’s the last part that has me in an uproar. I’ve complained about my age many times on this blog, Facebook, Twitter, IRL, and to the dog. I’ve also mentioned in a post that complaining about something you can’t do anything about is sort of silly right? This gets to the heart of my reason for boring you with all this. What’s the purpose of complaining? Some do it to make themselves seem more intelligent by putting things down. For some people it gives them conversation points and a way to relate with others who share the same complaints. Others deal with a lot of discomfort or stress in their lives and this is their coping mechanism. I’ll admit that often times I can be a complainer. It’s how I work through frustrations. I realize, of course, that this probably isn’t always the best way. Here’s what I’m going to try to do and what I suggest all of you do. Rather than crank about it, figure out how you can fix the thing you are complaining about. My back hurts and I took the time to find out what I could and couldn’t do anymore, found ways to improve my pain, and learn how to cope. My issues to work out are these – coping with the fact that I’m getting older, I’m no longer going to live pain free, and I won’t be able to do some of the things I love to do anymore. As part of my coping, I will not complain any longer about pain, or age. I can’t do much about either one. Complaining is just a means to distract you from the how. How can you fix the problem that’s causing your complaining? 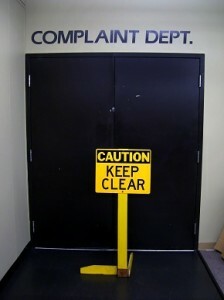 Complaints without discussing solutions is just a means of burdening others with your crap. State your problem, talk about possible solutions and implement something. For me, it’s going to be a better diet (which I’ve really slacked on), doing exercises of the non free weight variety, no more throwing the kids around the living room (It was all safe I promise), all heavy lifting will have to be curtailed as much as possible, and I will finish the flux capacitor and load in into my Delorean. This is my action plan to stop my complaining. Think about what you complain about every day and put together an action plan to fix it. It’s not always possible, as is my case with my back. I can’t heal it but I can learn to cope with it. Learning how to cope with the hand that’s dealt you through your fault or not is key. What do you think? All this needless complaining in our lives get you down? Would love to hear your thoughts. “Those towers sure were beautiful”… 9/11 10 years later.